Interdisciplinary course that covers the integration of interactive media. This course is designed to explore approaches, processes, histories and uses of experimental media production within the context of art making. 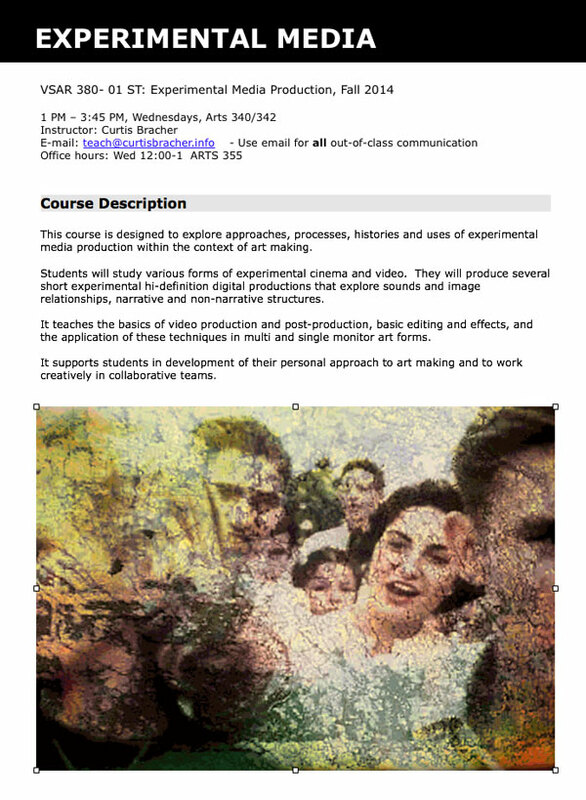 Students will study various forms of experimental cinema and video. They will produce several short experimental hi-definition digital productions that explore sounds and image relationships, narrative and non-narrative structures. It teaches the basics of video production and post-production, basic editing and effects, and the application of these techniques in multi and single monitor art forms. It supports students in development of their personal approach to art making and to work creatively in collaborative teams. Timeline Depth and Movement - Vertically and Horizontally. POV as Narrative Story, Camera Shots as Meaning, Interactive Collage, Color Manipulation, Editing the Audio/Visual Contract. Developing Time/Timing. Space between frames.Transformations, Blending. Rhythm, Counterpoint, Contrast, Pattern, Pacing, Basic Audio/Sound Editing, Blending Visual Perceptions, Phenomena, Visual Design and Experience. Video as Interface Design. Motion, Movement and Experience as Narrative Design Elements. Learning Embodiment. Gesture, Intention, Engagement. Installation and Performance Art. Filter and Effects with Live Audio/Video Processing such as Max/MSP or Isadora.